Coffee…a staple to the Italian diet and a habit that, when first arriving in Florence, I was unsure I would be able to manage. I have quite the sweet tooth and with a typical order at Dunkin Donuts including a high percentage of flavored syrup, I did not know if I would be able to enjoy the simple, heavy on espresso drinks made at Italian coffee bars. However, I have come to love my Italian coffee and am now not sure I will be able to go back to my old, syrupy latte ways. 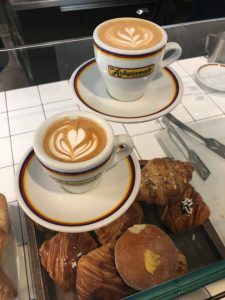 Other than the more simplified caffé drinks that Italian bars offer, there are a few key distinctions between the Italian coffee experience and the American coffee experience. One of the biggest differences is where one drinks their coffee. In America, it is normal to order a coffee and expect it to be served in a to-go cup, ready to be carried throughout the activities of the next hour. In Italy, since the drinks are small, you are expected to drink your coffee standing at the bar. While you may want to sit down and enjoy your coffee for a little while, you will be charged more, a “sitting fee,” that can be up to twice as much as you would pay for standing. Since you are expected to drink your coffee while standing at the bar, your drink will be served at a perfect temperature. 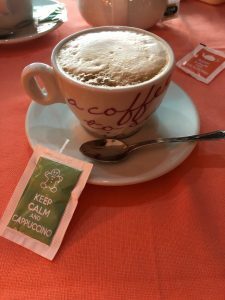 A way to distinguish yourself as an American when drinking coffee in Italy is to order a milk drink, such as a cappuccino, after 11 am. These are thought to be too heavy for a full stomach and “un caffé,” or a plain espresso, becomes the drink of choice. However, you will still be happily served if the temptation for a delicious cappuccino in the afternoon is too much. 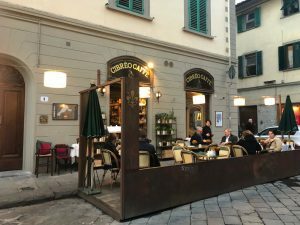 With a coffee bar at every corner in Florence, there are many opportunities to find your own favorite place. 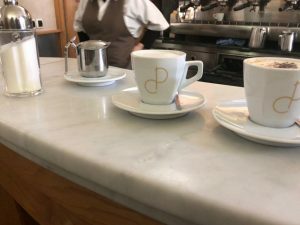 Below are a few of my favorite coffee stops in Florence, and a review of each. This coffee bar quickly became my favorite local coffee spot. A quaint little shop near the Sant’Ambrogio market, their cappuccinos are very smooth and a little bit sweeter, satisfying my sweet tooth without having to add a lot of extra sugar. The intimate setting attracts mostly locals and makes you want to stay a while. Typical to many Florence restaurants, there is an outdoor seating area for those nice days when you don’t mind paying a little more for your coffee to sit and enjoy. This was the first coffee bar that I visited once I got to Florence. With a full display of delicious pastries in addition to the coffee, this place is always busy with both visitors and locals. The employees don’t speak much English but are always willing to assist with a smile on their face, putting a smile on yours. A nice, small bar with room to sit, this is a great place to stop by for a quick caffeine fix before class. Their macchiatos are smooth and if you are in a hurry (although not the Italian way), Caffè Michelangiolo allows you to take your drink to-go. This is a hip coffee bar that is an ideal place if you need a spot to study. The coffee, although not my favorite, is presented with “latte art,” adding to the trendy experience.